Droppings are unsightly on a residence or a corporate office, and in warehouses can cause very serious economic loss due to contamination of the stored product.The droppings are also acidic and can damage masonry, as well as transfer diseases such as Histoplasmosis to you and your loved ones. Their nesting also blocks apertures such as gutters that can lead to flooding, and act as a harborage for parasitic insects such as bird mites. PCI has accounted for this problem and would like to provide our integrated, customizable BirdPro® solutions to you. Bird Wire System – Tensioned stainless steel wires form a landing barrier. UV-stabilised nylon used. No water absorption so it won’t split. UV light treated to withstand any sun damage. 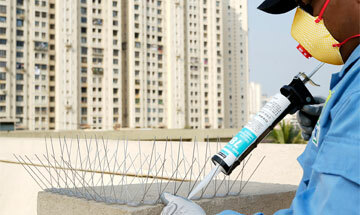 Upward point spikes that prevent birds from landing or roosting on ledges. Blunt tips don’t hurt the birds. Unique track-system that is the most discreet. UV and water stabilized track is made. Powered by solar energy so eco-friendly, cost-effective and self-sustaining.